his scenery package updates the small Garberville airport, located on the Northern California Coast. Taxiway widths, runways, and parking were updated. This also places a few objects from the default FSX scenery libraries. View Readme file for installation and notes. Compiled using Airport Design Editor. By Phillip Coyle. This is an update for Hana Airport in Hana, Hawaii. It updates runways and taxiways based on real world demensions from Google Earth. Various objects from the default FSX scenery libraries were also added. View Readme for installation and notes. Compiled using Airport Design Editor. By Phillip Coyle. FSX Island of Crete, Greece. FSX Crete Greece. Crete is the biggest island of the Greek archipelago and is the south rampart of the Aegean sea. By Toni Agramont; mesh terrain by Miquel Regalado. FSX Alf's UK Airfields Volume 7. Upgrades many small UK airfields whose default versions have little or no detail. Based on Google Earth and airport guides. This volume includes EGFA Aberporth/West Wales; EGPR Barra, Outer Hebrides; EGHU Eaglescott. By Alf Denham. FSX Alf's UK Airfields Volume 6. Upgrades many small UK airfields whose default versions have little or no detail. Based on Google Earth and airport guides. This volume includes EGHJ Bembridge, EGTU Dunkeswell and EGBK Sywell/Northampton. By Alf Denham. 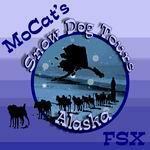 FSX Snow Dog Tours III, Anchorage, Alaska (AK). Includes these airports: PABR - Wiley Post - Will Rogers Memorial, 2AKE - Icy Cape AFS, PASC - Deadhorse, PAUM - Umiat, PARC - Artic Village, PABT - Bettles, WBQ - Beaver, PAEA - Eagle, 9AK4 - Artic Angel, 16Z - McGrath, UMM - Summit, AK06 - Denali, PAIN - McKinley National Park, RDV - Red Devil, PANI - Anaik, PACL - Clear, PAVD - Pioneer Valdez, PAGK - Gulkana, DDT - Duffy's Tavern, 15z - McCarthy, PAFA - Fairbanks International, PANC - Stevens Anchorage International, PAUO - Willow, PAAQ - Palmer Municipal, PAWD - Seward, PAHO - Homer , PAKN - King Salmon, PADQ - Kodiak, PACv - Cordova - Smith, PAMD - Middleton Island, PATK - Talkeenta, PAEN - Kenai Mun. Also includes these seaplane bases: 1Z9 - Ellamar, PYL - Perry Island, 52Z - Summit Lake, A27 - Seldovia, PAEN - Kenai Mun., ALZ - Alitak, KOY - Olga Bay, AK81 - Amook Bay, WSJ - San Juan, 5Z9 - Lake Brooks, PAFA- Fairbanks, PANC- Anchorage, 5BL - Homer - Beluga Lake. Requires SDTP2.ZIP (above) . By Chris Carel.